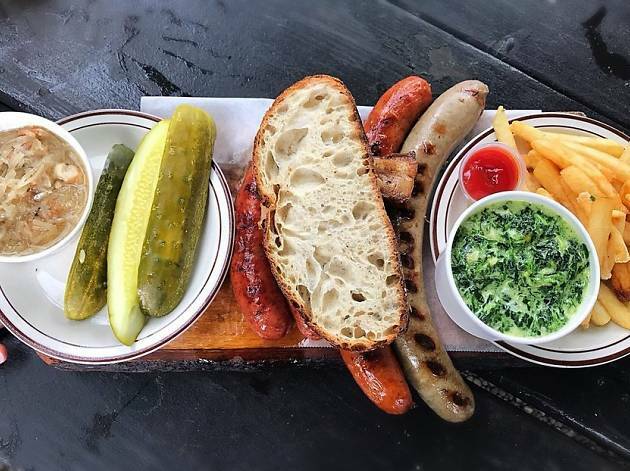 Photograph: Courtesy Yelp / Bogdan S.
Photograph: Courtesy Yelp / Steven S.
This authentic Czech beer garden, opened in 1910, offers plenty of mingle-friendly picnic tables, where you can sit and sample cheap platters of sausage and a solid lineup of European and domestic beers. 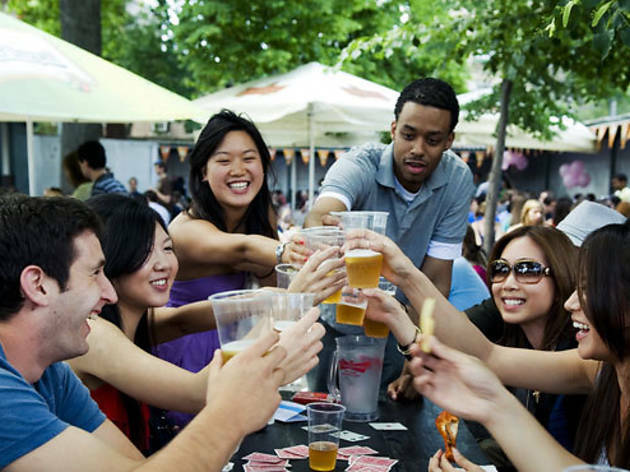 Though the huge, tree-canopied garden is open year-round, summer is the prime time to soak up some rays over a pint. Prost! I wish I had known about this place all summer. Tucked away in Astoria, this massive beer garden plus inside bar area is amazing. They had live music the night I went with tons of activities and drinking competitions and a silent disco. Food was great, atmosphere is great. Pig Knee........ I cannot say anything else other than get the pig knee with a friend.... or 2! This place is great except for the crowds. I like that it's family friendly. It's almost entirely outdoors, though there's a smallish indoor bar area. There's a stage for musicians and performers. Living only a few blocks away, this is a great place to go to spend a more relaxing night socializing. Their food is pretty good, but the atmosphere is rather underwhelming. One of my favorite beer gardens I've been to had games of jenga, ping pong, etc. Would suggest adding some things to do as such. The space has a lot to offer, and yet it still feels like its targeting a hyper local, niche crowd. The outside is somewhat unremarkable, and can be easy to miss, but it is relatively easy to get there by subway. The inside is spacious, with an open hall, a bar, and some inside seating - but the reason anyone comes here is the massive outside beer garden, with an outside grill, a large bar, picnic bench seating and a platform for live performance. Warm weather preferred, family-friendly, and crowded - but in an inviting, social way. I went here on Sunday for the Time Out Wing Fest. Very large space, lots of TV screens for soccer watching, multiple bars, but all in all not that impressive. Maybe when I think of garden I think of more trees and grass but there wasn't very much of either. The food was ok, the crowd was pretty tame which I always appreciate. But all in all I don't think I'd come back here. I will say however it is a super short commute to Manhattan and very easily accessible. 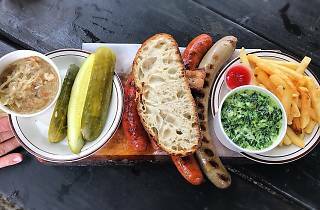 If you live in the city, there's a good chance Bohemian was/will be the reason you make your inaugural pilgrimage to that mystical foreign land they call "Queens." Call me jaded, pretentious, or snobby, but this place is truly underwhelming. Would barely be worth a trip to the Upper East Side, let alone the absolute last stop on the N/Q train. 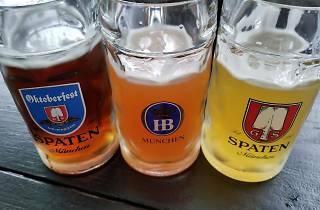 -The same beer options you'll find literally anywhere, including such regional specialties as "Blue Moon" and "Guinness"
Listen, I'm a big fan of the whole "beer garden" institution, hence the 3 stars. And Bohemian has plenty of room so it rarely gets crowded, but this place only reinforces the notion that Queens is not to be tampered with unless under extreme circumstances. 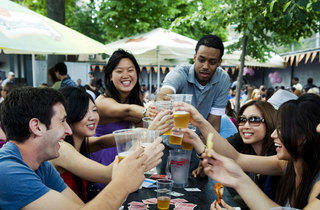 If you want a true beer garden experience, look elsewhere. I love this place. My parents used to take me when I was a kid just to run around but as an adult it's so perfect for summer, spring or fall drinking. The food is fantastic, the beer selection is giant and interesting. There is live music and space to dance! There's a large-ish smoking area as well which is fantastic for smokers because it's big and open and for non-smokers because it's separated enough to not takeover the whole space. All in all it really is a fantastic time and a great atmosphere. 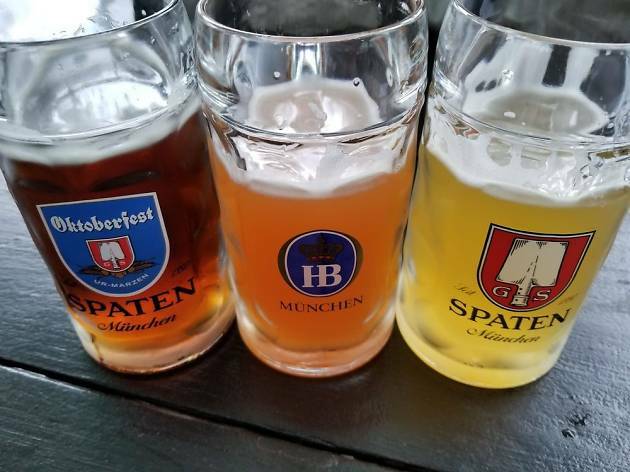 Situated near the end of the N/Q train in Astoria, the Bohemian Beer Garden is a tremendous outdoor beer garden that can easily be missed from the outside. A 15 stone wall surrounds the backyard area hiding it from the street. A large castle-like wooden door is one way to enter. Once inside, the atmosphere is casual and relaxed, unless there is a performance on their stage. The beer selection is decent and there is a grill that will whip up burgers and wursts. The long communal tables are perfect for large groups, but be sure to go early during warmer months. This place fills quickly and the line wraps around the block. Kids are welcome, until 8 o'clock, so if you need somewhere to drink beer and watch your kids, you have reached your destination.